Hi Jhon P yes agate from Balmerino south shore Firth of Tay Scotland. I think it would come under Perth and Fife in the attached map, but the area is well known here for agate. I went looking there for the first time this year and left with a few specimens. I'll be going back once the farmers plough there fields after harvest. Stunner I am an eye agate nut and that one is as good as they get. Botswana pinks are the only really good pinks I have . A real find. That really does look like a tasty salmon fillet! Nice color, very soothing stone. I found this agate whilst walking through a field and it looked like it had went a few rounds with the plough so i did a simple tidy up with the minimum of attention. Had a look at the Botswana pink agate's LithicSprings they're really nice so i will make my next trip to the Tentsmuir/Balmerino area as they seem to be predominantly salmon/pink agates and post some pics of my finds. I also found a small sliver of agate in the same field as this one and cabbed it and set it for a friend, she really liked it which gives you a bit of a boost that you're on the right track. Very cool, I traded for a few tiny Scottish agates years ago. Still got em. Most that I got tend to be that nice pink color. Thanks for the reminder and sharing yours. Hi Shain, i'm just getting the hang of locations for agate here so there will be more pics soon, hopefully. The salmon eye agate in the pic is only 25mm x 19mm or 1" x 3/4" so that would tie in with the tiny agates you have maybe? 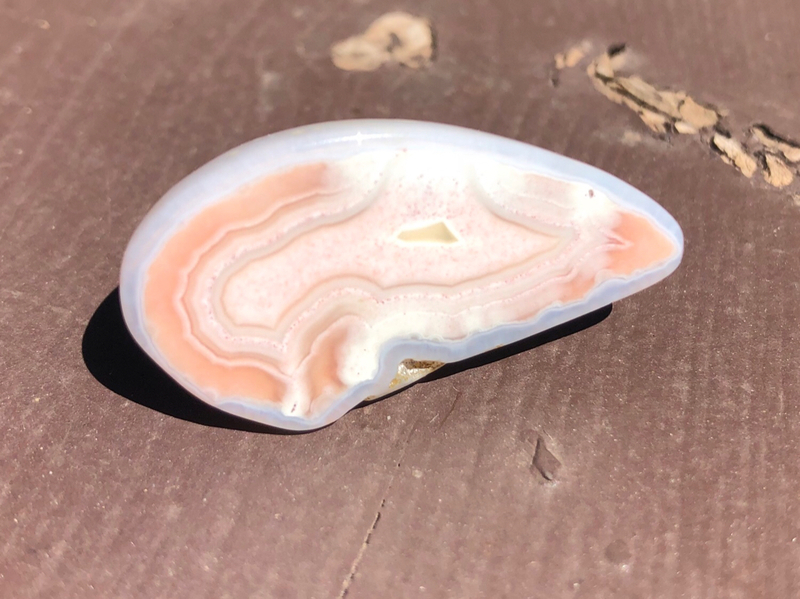 I also found a botroidal agate alongside the salmon pink one...first one of those too. Hey Brian, I believe the ones I got were collected on the western coast but it has been so long ago when I got them I could be wrong. Here is one I faced and then tumbled. Now thats nice, colours are so subtle and is that a little clear quartz pool in the centre? Its nicely finished, i may have to get a tumbler next.